Mamidi Kaya Charu and Nuvvula Podi is a great combination and is definately a Feast for Food Lovers. (Peel off the mango,slice cut them into pieces,pressure cook them and mash with 3 glasses of Water.Add Salt to taste and keep it aside.Now we must Season it. 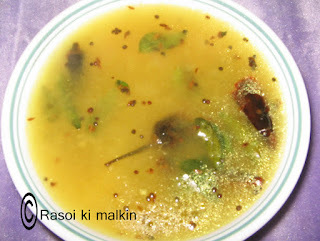 Place a Kadai on the flame,add 1 to 2 tsp of Oil and heat it.Now add Mustard seeds,Jeera, Red chillie slits ,Hing,,Haldi,when it splutters add Green chillie slits and Curry leaves.Now add already prepared Mango Juice to this and boil.Lastly add 1/2 spoon of Sugar and boil for 1 to 2 minutes and switch off the stove. Serve hot with Nuvvula podi.